I love the way this all plays so well together. 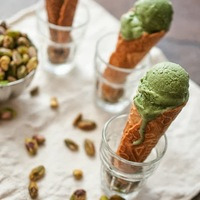 The pistachio comes through nicely and works well with the sugar cookie and biscuit, cone base. The caramel is fantastic with the vbic. Awesome stuff!